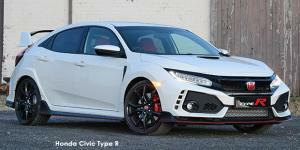 The Honda Civic Type R, available at Mekor Honda Cape Town, has a functional, aerodynamic style. The sporty look features LED front lights, a rear wing, red and carbon fibre dashboard trims and red bucket seats—exactly what you need to feel like an F1 race car driver. The Honda Civic Type R features an electronic parking brake allowing for an expanded storage cavity between the front seats. Rear legroom and an impressive 312-litre boot promote passenger comfort while the agile handling assist function and the multi-angle rear-view camera provides for more responsive and safer handling. Visit Mekor Honda at Mekor Honda Cape Town to awaken your inner racing driver with Honda Civic Type R’s high performing, turbocharged 2.0L VTEC DOHC 16V direct injection engine.